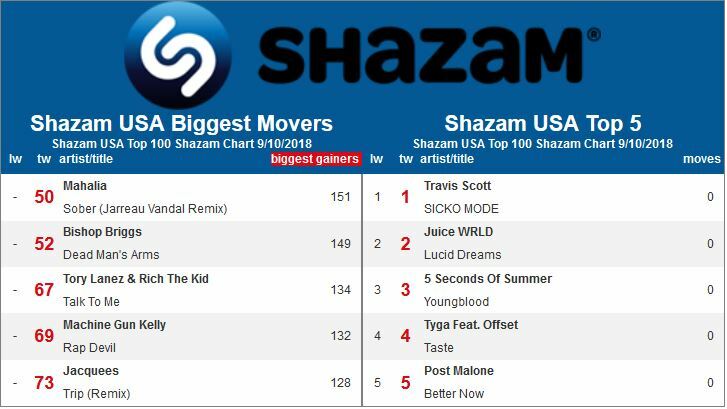 HBO’s Insecure and Starz’s Power are responsible for making tracks from Mahalia and Bishop Briggs this week’s biggest movers on the Shazam USA Top 100. Interscope has two songs among the big movers: Tory Lanez & Rich the Kid’s “TAlk tO Me” (Mad Love/Interscope) and Machine Gun Kelly’s new single “Rap Devil” (Bad Boy/Interscope), which is closing in on 60m views on YouTube since it was posted 9/3. Jacquees’ remix of Ella Mai’s “Trip,” an Internet sensation since its release over the Labor Day weekend, also makes its debut on the Shazam USA Top 100.